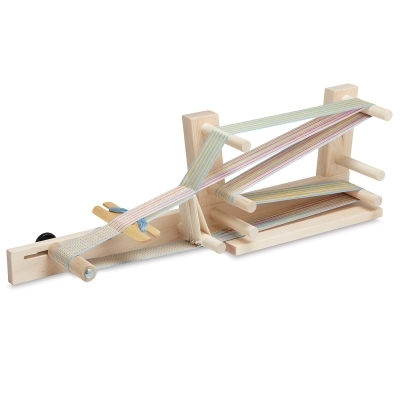 Perfect in the classroom or at home, the Schacht Inkle Loom is durable and easy to use. The ¾" pegs are pressed and glued into 1" deep holes to withstand the tension typical of an inkle loom. It has one open side for ease of warping (detailed instructions included). Warps can be up to 8½ feet long and 4½" wide. Adjust the warp tension during weaving with the easy grip knob on the loom's tension bar. The Inkle Loom is made of sanded, unfinished hard maple. The belt shuttle is not included, please purchase separately. Inkle looms are used for weaving narrow bands that can be used as belts, straps and trim. See how to get started warping and weaving on your Schacht Spindle Inkle Loom.